If there is justice, Syvilla will be happily weaving in heaven; creating, problem-solving, teaching. Some memories stand out. 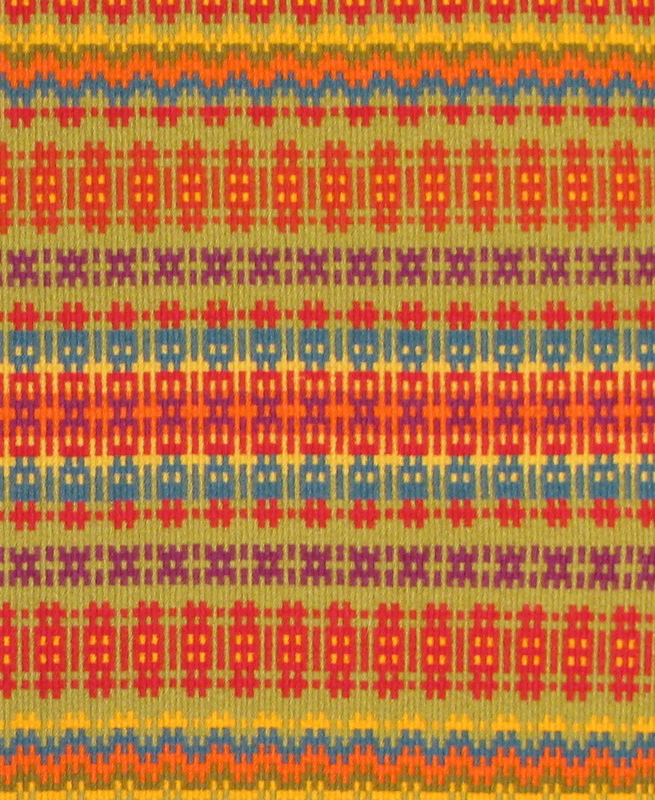 A couple of years ago I was finishing a weaving (shown here) and discovered I would be short of a lovely bright gold color. As usual, I was weaving with Rauma spelsau yarn purchased from Syvilla. I searched everywhere, in stashes of leftover yarn, in all my cupboards. It was time for a late-night email to Syvilla. Help! Normally, Syvilla grabbed the needed skeins from her shelf, packed them in a padded envelope or small box, and walked them to the Decorah Post Office before four p.m. The next day the box turned up on my doorstep. It seemed instant. I was like a junkie, needing my Norwegian yarn fix, and she was the ever dependable supplier. This time there was no bright gold on her shelves, but the shipment from Norway was due soon. She had an idea! She happened to have her loom warped with the yarn I needed. She wasn’t going to be weaving it soon, she explained in a note, so she just TOOK MANY THREADS OFF THE SIDE OF HER PROJECT ON THE LOOM. She didn’t ASK me if this was necessary, which it really was not, she just did it. This gave me enough yarn to finish the piece I was weaving. A package from Syvilla was always like receiving a gift. One year, it really was. A mystery box contained a plastic storage box, and in the box a whole set of small skeins of tapestry yarn, all the colors of the Rauma rainbow. Fellow weavers would understand the jolt of pleasure this brought. But why? Syvilla wrote that I had been her best customer in the previous year, so it was an appreciation gift. I’m still using that yarn when I need a spot of color, or in small tapestry projects. No trip to Decorah was complete without a visit to Syvilla’s yarn shop in the basement of her home. It’s so difficult to choose yarns from tiny snips pasted on a color card. At Syvilla’s you could sit in a well-worn easy chair, drink in the colors of the skeins lining the walls, and pull them down into sets. No – too sharp! No – too boring. No – too blue! Finally the right combination was at my feet, and soon in my bag. What a privilege it was to have Syvilla’s advice and support and friendship. Syvilla had a sharp mind, and her advice came from reading and study and hands-on experimentation. She came to our Scandinavian Weavers Study Group in Minneapolis, hours away from home. I think these were important gatherings for her. She added to our lives. She didn’t give up her fight for life and health easily. I remember her telling me some time back that sitting at the loom was hard for her; the cancer pain was too much. What she could do in the meantime, she said, was to sit with graph paper and sketch out diagrams for rutevev (square weave). She was ever hopeful that weaving time would come again. This is a sad day, but one filled with good memories.